Credit: Betsy McCully. English Plantain floret. 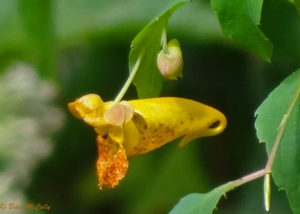 The flower is wind-pollinated. Forbs and Eurasian grasses (which had migrated with the herds as animal domestication spread across Europe from its Neolithic beginnings in the Middle East) were in the cattle feed on ships that transported both cattle and humans from Europe to the Americas. Clover and Kentucky Bluegrass (a misnamed European species) were deliberately sown together by English colonists as excellent forage crop; both spread across North American like wildfire. credit: Betsy McCully. Jewelweed (Impatiens capensis). Also called Orange Touch-Me-Not. John Josselyn, an English gentleman with a keen interest in botany and medicine, visited New England in the 1600s, and published the earliest English account of New England’s flora (among other topics of natural history), New England Rarities (1672). He recognized the familiar weeds he knew back home, including Dandelion, Sow-thistle, Shepherd’s Purse, Nettles, Nightshade, English Plantain, Mayweed, Mullein, and Wormwood. 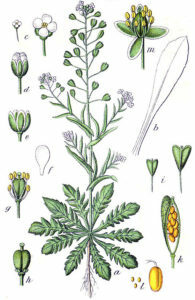 He also found many native plants new to the English, and described their medicinal uses among the Indians. A number of naturalists catalogued New York City’s wild flora beginning in the early 1800s. Samuel Latham Mitchill, physician and surgeon-general of New York State, amassed a private collection of wild plants in the New York City region, listing their known medicinal uses. As president of the Lyceum of Natural History of New York, Mitchill was instrumental in the effort to catalogue the flora of both New York City and State. A census of flora in Manhattan conducted by John Eaton Le Conte in 1811 tallied 450 species (this first publication of naturalist LeConte was written in Latin). Botanist John Torrey collected plants within a thirty-mile radius of New York City (Manhattan), assiduously sorting out native from non-native plants, noting their medicinal as well as culinary uses. On Manhattan, he identified many of the grasses of “meadows, parks, lawns, and roadsides” as naturalized European species, including Timothy Grass (Phleum pratense), Fox-tail (Alopecurus pratensis), Crab-grass (Digitaria sanguinalis), Brome Grass (Bromus species), and Bermuda Grass. Other non-native plants included Privet (Ligustrum vulgare), Speedwell (Veronica agrestis), Mullein (Verbascum thapsus), Bittersweet (Solanum dulcamera), Wild Carrot (Daucus carota), Tansy (Tanacetum vulgare), and Shepherd’s Purse (Thlaspi bursa-pastoris). (I have used Torrey’s nomenclature.) He published his catalogue in 1819, listing the plants by their Latin and common names and giving the places where specimens were collected. He also catalogued the flora of New York State in 1843, counting 160 plant species as introduced or naturalized. The count might have been 161 had he known that Clover (Trifolium repens) was an alien; he supposed it to be native because “it springs up everywhere.” Other alien plants included Berberis vulgaris, Common St. John’s Wort (Hypericum perforatum), and Wild Mustard (Sinapsis arvensis) — a “noxious weed.” A now-rare native wild plant he listed was American Globeflower (Trollius laxus). 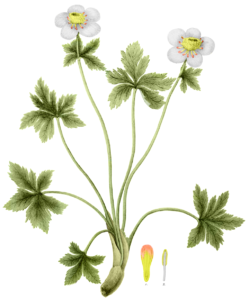 Globeflower (Trollius laxus). By John Torrey, A Flora of the State of New-York, Vol. 1, 1843 [Public domain], via Wikimedia Commons. Now a rare wildflower in New York. 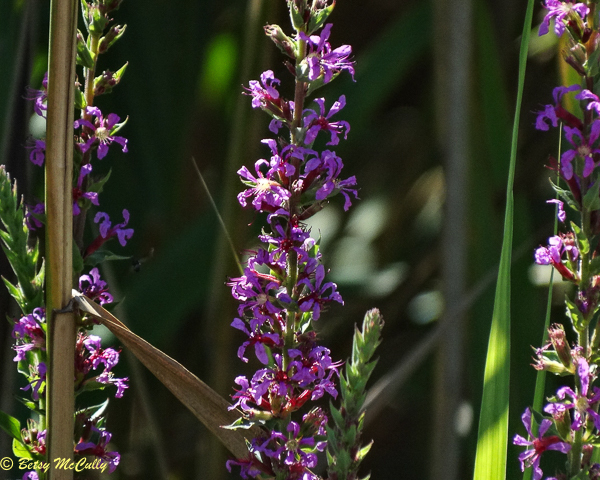 Grows in wetlands. Are all weeds noxious and undesirable? It all depends on the context. Perhaps you know Emerson’s dictum that “a weed is a plant whose virtues are undiscovered.” Well, a weed may also be a plant whose virtues are forgotten. In the early natural histories of New York and New England mentioned above, there was no mention of weeds; rather, the emphasis was on the medicinal uses of both native and non-native plants. To the American Indian and Euro-American colonist alike, wild plants were sought out for their healing properties. Europeans were keen to learn how American Indians used wild plants to treat various ailments. And no doubt, American Indian healers, usually women, were interested to know how their European counterparts used the introduced herbs they now found in their country. 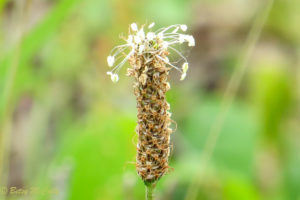 English Plantain is one example. There are native plantain species, and like its cousins, English Plantain offers similar curative aids. So, in calling wild plants that colonize our lawns and gardens weeds because we don’t want them there, we may be overlooking their virtues, both medicinal and edible. Of course, there are truly noxious weeds that crowd out other species and invade native ecosystems. One example is garlic mustard, which is invading woodlands. And there are the weeds that will take over our gardens and farm fields if we do not control them. So what do we do? Reach for the herbicides? Our environment is loaded with toxic residues of chemical herbicides and pesticides. Rachel Carson in her classic Silent Spring, written way back in the 1960s, documented the hundreds of chemicals that were poisoning not only our environment — the air we breathe, water we drink, and soil we grow our food in — but our bodies. She questioned what the synergistic effect of all these chemicals combined must be having on our own cells — our body’s ecosystem — as well as on our environment. That was decades ago. As a result of her book, one pesticide, DDT, was banned in our country. One in hundreds, perhaps thousands. Imagine how many chemicals today poison our air, waters, soils, ecosystems, and bodies! A new study is needed to monitor these chemicals. In the meantime, we must use alternatives to control weeds. We can choose safe alternatives to powerful herbicides like Roundup, biological controls, and we can try old-fashioned hand-weeding and cultivating. I have done all three when I had a small garden in Brooklyn, and it was a flourishing garden. And maybe, as you weed, you might not throw that weed into the compost pile, but into your salad. Dandelion greens. Purslane. Unsprayed of course. But make sure you can identify them! Learn about edible and medicinal wild plants. The Natural Heritage Program of New York, a joint venture of the State University of New York College of Environmental Science and Forestry and the NYSDEC, monitors the status of native species, and classifies them as rare, endangered, threatened, or of special concern. The Invasive Plants Council of New York State tracks invasive plants and their impact on native plants and habitats. The Invasive Plant Council of New York State defines invasive plants as those “that aggressively compete with and displace locally adapted native plant communities.” While many invasives are introduced species, such as Oriental Bittersweet and Japanese Knotweed, a few are not, such as Phragmites and Black Locust. Invasive plants hoard light, steal water and nutrients from desired plants, and may even alter soil chemistry. According to the New York Metropolitan Flora Project, under the auspices of the Brooklyn Botanic Garden and directed by Steven Clemants, “besides the destruction of habitat, the greatest threat to native plants in the metropolitan region is the introduction and spread of nonnative plants.” (Clemants et al, 2002). For example, the aggressive spread of Oriental Bittersweet (Celastrus orbiculatus) has displaced native American Bittersweet (C. scandens). Similarly, non-native Purple Loosestrife (Lythrum salicaria) has aggressively displaced native species of loosestrife and other wetland flora. 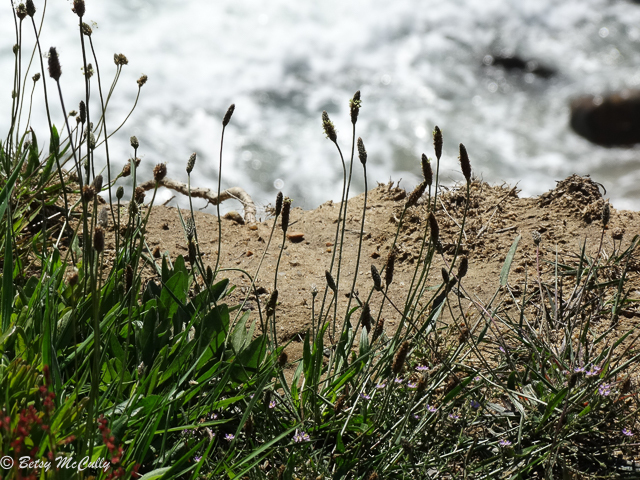 What can we do about invasive plants? If you are a gardener, stop planting them. If you are a property owner, try to eradicate them through biological means. Herbicides like Roundup are non-selective and will kill native or non-invasive naturalized plants as well as introduced invasive plants. Herbicides like Roundup have been used by farmers to kill unwanted “weeds” that may be beneficial to pollinators. Milkweed, the sole host plant for the monarch butterfly, is a prime example. 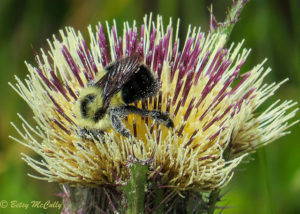 But even weeds considered noxious, such as thistles, attract pollinators that will also pollinate our food plants. You can learn about biological controls by visiting the website of the Center for Invasive Species (invasive.org). And you can get tips on sustainable gardening from organizations like the New England Wildflower Society. Credit: Betsy McCully. 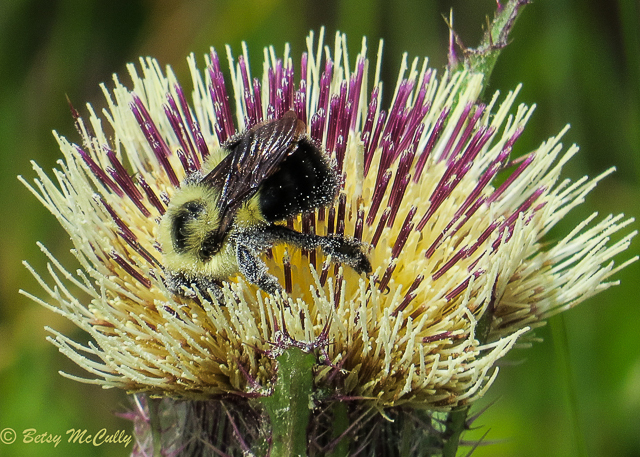 Yellow Thistle (Cirsium horridulum) and pollinating bumblebee. One of the critical things we can do to protect our native flora is to protect the habitats where the plants grow. When Torrey conducted his survey of wild flora in the New York City region, he found the rarest plants growing in a white cedar swamp, a habitat that was already endangered as cedars were rapidly being cut down. Native plants are those that have evolved and adapted over time to particular habitats and conditions. Invasive plants colonize disturbed sites. Preserving the native habitats as much as possible is crucial to preserving the wild flora that have adapted to growing in them. We also need to understand that wild flora, like wild animals, are integral parts of whole ecosystems. 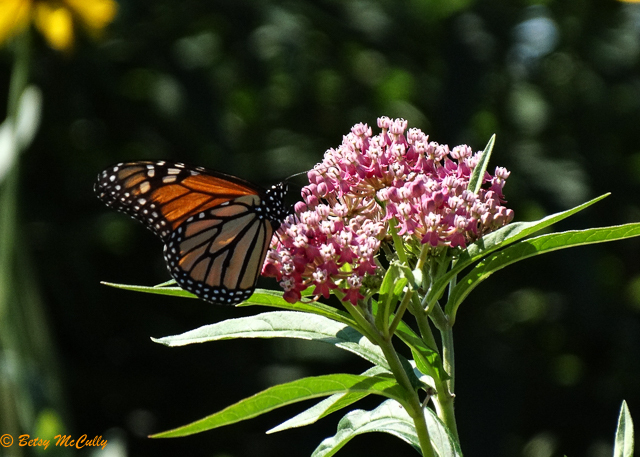 Wild plants depend on pollinators to propagate and pollinators such as bees and butterflies depend on wild flora for food. Pollinators like bees may have co-evolved with flowers 90 million years ago! Each species plays a part in an interdependent web of life. Pluck one strand and the whole web collapses.